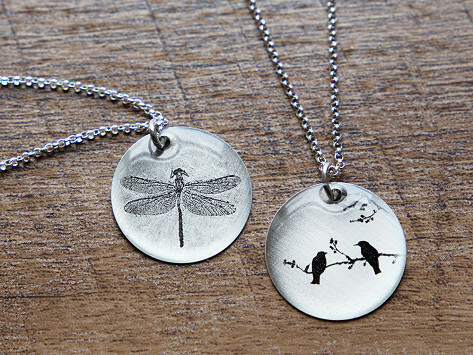 Highly detailed prints directly on sterling silver, finished with resin on a sterling silver chain. Simple, elegant, and meaningful. Dimensions: Image Pendants: 0.87" diameter; Type Pendants: 0.75" diameter; Chain: 18"
Gave it to my Wife for Valentines Day. Absolutely loved it even the box it came in !! Too small to see the image of a galaxy--just a gray blob. 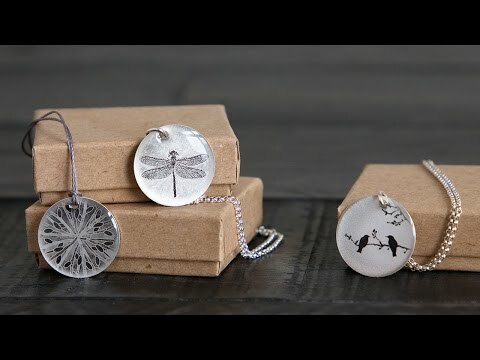 In a beautiful testament to the “less is more” school of thought, Jeff Ryan and Barbara Edelman have printed black-and-white images on sterling silver to create simple necklaces that stir up all sorts of emotions with the lightest touch. Warrior Pose suggests strength, for example, while Olive Branches and Tightrope Walker evoke feelings of peace and balance, respectively. There’s also Cliff Diver, Bird Flock, Nest, Hummingbird, and Tree. The images are all different, but they share a poignant, minimalist vibe. Jeff and Barbara work out of their Santa Fe, N.M., studio, and they’ve spent the last few years experimenting with different ways of applying images onto metal. Each necklace is handcrafted. The images are coated with a jewelry resin, which adds dimension, then strung on a silver nylon cord with a sterling silver clasp. Deceptively simple, these picture pendants are picture perfect, for yourself or someone special.